*Chuckles* I just can’t believe that I will get engaged in few hours. A long distance relationship now start to put on a new commitment which I called engagement. After this engagement, I believe the my current lifestyle slightly will change. I’m no longer available all the time. I might skip some outdoor event in which I always did. Hope the event running smoothly. Pray for our happiness. 😉 Gulp. Our engagement will be held at Jln Pertanian, Kg. Marabahai, Tuaran Sabah, 10AM starts till I-don’t-know. Congratulation to u and ur fiance (*_*). la la la fiu fiu fiu (nyanyi2 siul2). Sheila.. ya bah.. club taken.. hahaha..
Mell.. ko mimang! Kalau kahwin.. sya heret jak ko ni..
Fionz..ya.. and thank God.. all went well..
Sarah.. thank u.. kita belum lagi terjumpa ni..
best of everything in your journey to the next stage of relationship. 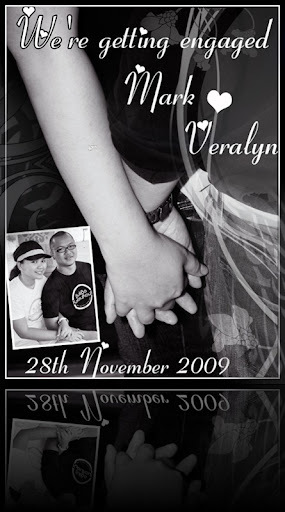 Congrates Vera… and good luck to new commitment of life ahead..
congrats to both of you~! !